Why is the day of Mercury (Wednesday) followed by the day of Jupiter (Thursday), rather than by that of the Moon (Monday) as would be expected from the order of the planets (Saturn, Jupiter, Mars, the Sun, Venus, Mercury, the Moon)? Planetary hours are the key. Planetary hours were part of Hellenistic astrology. Their use was advocated by Vettius Valens (2nd century CE) and his material on them has some very interesting elements. The ordering of the week pertains to the Hellenistic practice of putting the 24 hours of the day under the dominion of each of the planets in order. The ancient Egyptians and Babylonians divided the day into 24 hours, but based on the length of day and of night. They did so by dividing the time from sunrise to sunset into 12 equal hours, and that from sunset to sunrise into another 12 equal hours. These are called the seasonal hours as they vary in length depending on the given season (day hours are longer in the summer but shorter in the winter). There is some controversy over who started putting the hours under the dominion of the planets. Rutgers sociology professor Eviatar Zerubavel in his book on the history of the week asserted that it wasn’t until the Hellenistic period that the practice started occurring. His dating, around the 2nd century BCE, puts the advent of planetary hours in roughly the same period as the Antikythera mechanism and the origins of horoscopic astrology. The planetary hour system is the source for the planetary days and the seven days of the week. According to English classics scholar Leofranc Holford-Strevens, “the week as we know it is the fusion of two conceptually different cycles: the planetary week, originally beginning on Saturday, derived from Hellenistic astrology, and the Judaeo-Christian week, properly beginning on Sunday” (p. 64). There are 7 planets and 24 hours which cycle through them. This means that all 7 planets cycle through three times with 3 hours remaining (3 times 7 is 21; 24 minus 21 leaves a remainder of 3). Therefore, the 25th hour, or 1st hour of the next day, starts with the 4th planet in order from your (inclusive) starting planet. 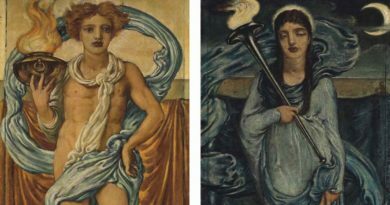 The 22nd, 23rd, and 24th hours of the Mercury day (Wednesday) are the hours of Mercury, the Moon, and Saturn respectively. The first hour of the next day is that of Jupiter (Thursday), the planet which follows Saturn. In this way, you always skip two planets after your starting planet to get to the next day. If today is the day of Jupiter (Thursday), then skip Mars and the Sun, giving you Venus (Friday) as the day tomorrow. 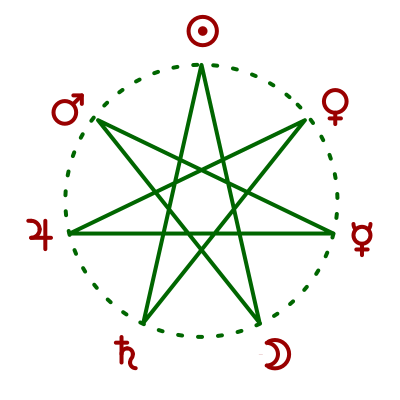 The heptagram, a seven-pointed star, once served as convenient aid for remembering the order of the days of the week. The planets are inscribed in the “Chaldean” order clockwise around the outside. Following the inside lines in clockwise order yields the order of the days of the week. The seven day week was rather foreign to Romans prior to Constantine. It was known of since the time of Augustus (1st century CE) but Romans favored other systems for organizing the days. The Roman emperor, Constantine I, whose mother was Christian, ruled in the early 4th century CE. He is best known for ending the persecution of Christians, legalizing Christianity, convening the First Council of Nicaea, and himself converting. His influence on the calendar is felt to this day, around the world, in his adoption of the seven day Christian week and the planetary naming conventions of Hellenistic astrology. Constantine also set dies Solis, the day of the Sun, as the day of rest and worship. That change may have upset some Jewish Romans, and even some Christians, as the Sabbath was the last day of the week, our Saturday. However, Christians held that Jesus was crucified on the 6th day (Friday) and was resurrected on the third from that (Sunday), so the first day of the week (our Sunday) became their holy day. It is thought that Constantine’s setting aside the day of the Sun was also an attempt to curry favor from the many Sun worshipers of the empire, including Mithraists. Constantine was also known to equate himself to the god Sol Invictus (unconquerable Sun) throughout his life despite his embrace of Christianity. The names for the days of the weeks in many European countries come straight from the Roman days for the corresponding planets (but often with Sunday modified to the Lord’s day). However, the British resisted the seven day scheme until the Anglo-Saxon conquests of the 5th century inspired them to take up the Roman custom but with a twist. They inserted their own corresponding Germanic (Norse) gods in place of the Roman ones for four of the days of the week. Tuesday was named for Tiw, god of war (according to some), corresponding to Mars. Wednesday was named for Woden, god of wisdom and poetry, corresponding to Mercury. Thursday was named for Thor, god of lightning and protection, corresponding to Jupiter. Friday was named for Freya, god of love, corresponding to Venus. Do you start the day with sunrise or sunset? This is a bit controversial. Our civil day comes from the Romans who started the day at midnight. By contrast, the Egyptians started their day at sunrise. However, the Babylonians and ancient Greeks (including Greek Egyptians) started theirs at sunset. The Wikipedia article on planetary hours, as of this writing, cites Valens as support for the start of the day at sunset, which requires a bit of explaining. Valens’ explanation of planetary hours is slightly confusing due to the fact that he says he will use as an example the first hour of the night on a given date. But then he goes on to find the day as a Mercury day, with its first hour belonging to Mercury. I think this interpolation between this example and its assumed solution is what gave some readers the impression Valens started the day at sunset. However, Valens then goes on to enumerate the hours of that day and that night, specifically citing that the first hour of the night is that of the Sun. The fact that his day is that of Mercury and the first house of the night is that of the Sun clearly imply a day starting at sunrise. In fact, it is in the next chapter that Valens returns to the same example and specifies that the day is Mercury and hour is the Sun (see quote below). The attribution that Valens used days starting at sunset is a clearly false one. It is interesting that Valens started the day at sunrise for astrological purposes, like the Egyptians, but in contrast to the sunset custom of the Greeks and Babylonians. Very few Hellenistic astrologers mentioned planetary days and hours or their astrological significance. The use of the days and hours became more popular in the later medieval period, and then they also used a sunrise start time. However, Valens did consider these planetary periods to be significant astrologically. He even looked at planetary years and months as well. Due to the use of Egyptian month names, Valens description for finding planetary months and years can be confusing. However, the principle appears to be very simple and is the same as that for planetary days. The ruler of the first planetary day of the month is the ruler of the planetary month. Similarly, the ruler of the first planetary day of the year is the ruler of the planetary year. In otherwords, they all follow from the progression of hours, just like the days of the week did. Valens set this out in Book I, Ch. 10P. January 1st of 2019 falls on a Tuesday, making this a year and month of Mars. 2018 was a year of the Moon, and 2017 that of the Sun. Apart from years following leap years, we move to the next planet in the order of the days of the week each year, which is why 2020 will fall to Mercury (Wednesday follows Tuesday). As 2020 is a leap year, 2021 will skip a planet in the day of the week order, going to Venus (i.e. the first of the year falls on a Friday). The reason for this annual progression to the next day of the week is due to the fact that 364 is a multiple of 7. Therefore, 365th day of the year falls to the same planet as the first day of the year. Similarly, the first day of the new year will be the day that follows the first day of the last new year. When there is a leap year, then there are 366 days in the year, so the new year involves skipping a day. What is the Alexandrian Calendar? Vettius Valens used the Alexandrian calendar. What is the Alexandrian calendar? It was a reformed Egyptian calendar as initiated by the Roman emperor Augustus after his defeat of Antony and Cleopatra in 30 BCE. 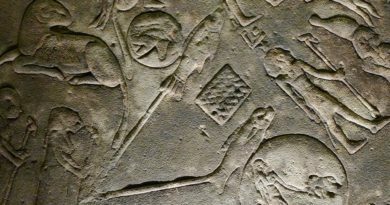 He had Egypt start using this new calendar starting on the Julian date of the 29th of August 23 BCE, which would become the Egyptian new year (1st day of the month of Thoth), with 365 days in the calendar, and a 366 day leap year every 4 years. The Alexandrian year consisted of 12 months of 30 days, with 5 (6 on a leap year) days appended at the end of the year. It is important to keep in mind that Valens used the Alexandrian calendar, not the older Egyptian calendar, as both used the same month names. This is because the Alexandrian calendar had leap years and kept step with the Julian calendar. The Egyptian calendar had lacked leap years despite the best efforts of Ptolemy III in the 3rd century BCE to have them inserted, a change the priesthood would not abide. Note that there was also a more complicated Egyptian lunar calendar with alternating 30 and 29 day months, but this was not used by Valens as his months are all 30 days in length. The Alexandrian year was much like ours, 365 days with a leap year every 4 years. This Julian-based system of years is being referred to by Valens when he noted the number of leap years as 36 after 148 years of the Augustan era. 148 divided by 4 is 37, but the first year was not a leap year, so 36 leap years had occurred. Keep in mind that the Alexandrian calendar is like ours and that our calendar results in the next day of the week starting each successive year, except for a skip after leap years. Let’s unpack this dense passage. Note that Valens starts the first day of the first year of the era as a day going to the Sun. Each year will push to the next planet, but each leap year will push it one further. Therefore, he adds the number of years to the number of leap years, yielding 184. As he is counting inclusive of the first year (that of the Sun) he also adds the first of his current year to the total (Thoth 1) yielding 185. 185 divided by 7 is 26 with a remainder of 3. Therefore, we end on the third day from Sunday, inclusive of Sunday itself (Sunday, Monday, Tuesday). This lands us on Tuesday, the day of Mars, for the first of the current year. After the passage above, Valens noted that with his 30 day months he could pretty easily find the planet of the month because it will always be the third day of the previous month (i.e. go forward in skips). He was examining the 6th month and already noted that the first month (first of the year) went to Mars (Tuesday). So the first month went to Tuesday, the second to Thursday, the third to Saturday, the fourth to Monday, and the fifth to Wednesday. Therefore, the 6th month (Mechir) started with a Friday, giving the month to Venus. He then proceeded to find the day from there. The 36 extra leap year days are called “intercalary days” in the Project Hindsight translation. The more correct translation is the number of “leap years” as given the in Riley translation. Intercalary days is ambiguous as it is more typically used to refer to the 5 days appended at the end of the Egyptian year, which is clearly not Valens’ reference in this instance. As noted, Valens clearly used an Alexandrian calendar with a full year of 365 days (and a quarter accounted for with leap years). 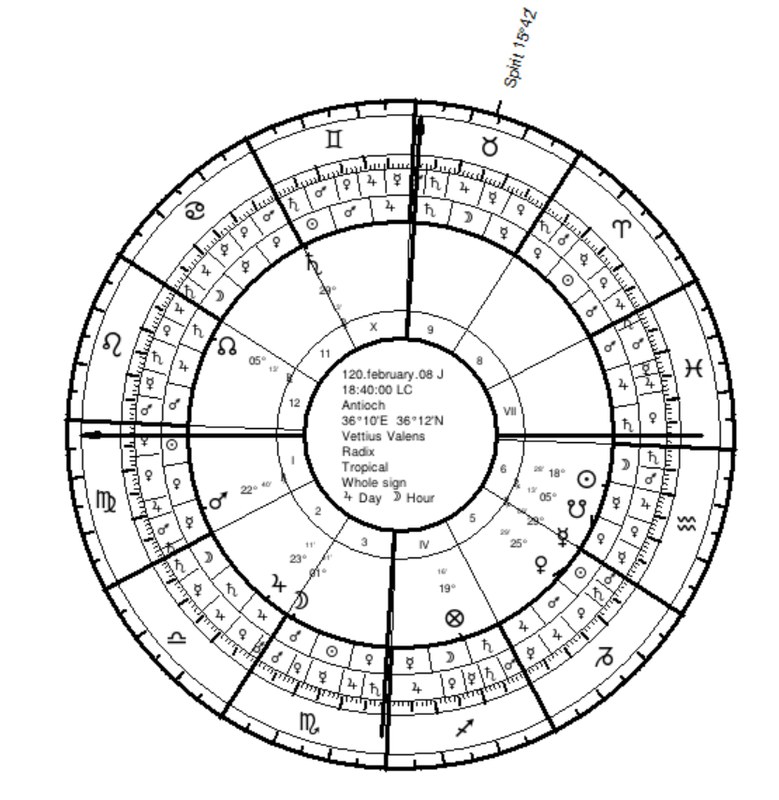 The only time Valens used a year of 360 days was specifically as a period for a natal predictive technique now known as zodiacal releasing (“the distribution”). Valens considered the planetary year, month, day, and hour rulers to be astrologically significant. The impression is that the example given by Valens is that of someone’s birthday (most likely Valens’ own). The planetary year, month, day, and hour in which we are born is important to Valens. He instructs us to look at the natal state of those planets by sect and place. For prediction he also advised to look at the interactions between the period rulers at birth and those of the current time periods. Mechir 13 is most likely Valens own birthday, as the date Mechir 13 comes up repeatedly in the text. David Pingree claimed Valens included his own chart with a Feb. 8th, 120 birthday. 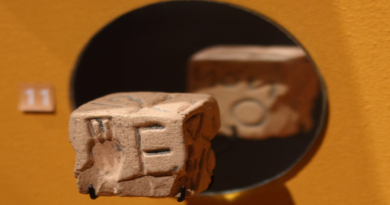 The date is given as Hadrian year 4, meaning the 4th year of the reign of the Roman emperor Hadrian, which would have been 120 CE. Normally, Mechir 7 would fall on Julian Feb. 1st, with Mechir 13 corresponding to Julian Feb. 7th. However, on a leap year Julian Feb. 1st corresponded to Mechir 6, putting Mechir 13 at Feb. 8th. Therefore, Valens appears to have been born under a Mars year, Venus month, Mercury day, and Sun hour. He was born in the first seasonal hour after sunset. Greek Egyptians would have reckoned a new day from sunset. This may be why Valens puts the date as Mechir 13/14 at one point in his text, as he was born an hour after sunset. Astrologically he was still Mechir 13, but by the civic calendar he would have been Mechir 14. Reading other passages pertaining to this Mechir 13-born native, who comes up again and again, we find more about Valens’ chart. He was born with Virgo rising, Mars in the Ascendant, Mercury (Asc lord) and the Sun in Aquarius in VI, and Moon in Scorpio in III. He also had a strong cardinal configuration of Saturn in Cancer in XI, dominating Jupiter in Libra in II, in turn dominating Venus in Capricorn in V (opposed to Saturn). Valens repeatedly mentions that this person has the Sun at 22° Aquarius and Moon at 7° Scorpio. Valens used sidereal tables for his chart calculations and they were known to have a little bit of error. Given Valens notes about Virgo rising and being born in the first hour of the night, his Ascendant would have to be early in Virgo. Virgo does not begin to rise until near the end of the first hour. I initially calculated his chart in the Fagan-Bradley ayanamsha. The positions are pretty close but the error in the Sun position makes it clear that the difference from the tropical zodiac of his sidereal tables was significantly greater than that of Fagan-Bradley ayanamsha. For this reason, I include the Fagan-Bradley chart further below but only for reference. It is not an accurate reflection of the sidereal tables available to Valens. I’ve calculated the sidereal chart with the Raman ayanamsha because it best reflects the sidereal tables Valens used. Valens reported the Sun at 22° Aquarius, consistent with Raman, while Fagan-Bradley would put it at 19º Aquarius. We would not expect to have significant sidereal error for the Sun’s position. Therefore, the Raman ayanamsha best reflects the sidereal tables Valens relied upon. With the Raman ayanamsha, Virgo begins rising at approx. 6:10 pm and the first hour of the night ends at approx. 6:42 pm. The time I use below is less than 5 minutes before the end of the first hour and about 30 minutes after Virgo started rising, so it is a good approximation. Note that Valens reported his own Ascendant to be 7° Virgo. The second hour of the night actually starts while 6° Virgo is still rising. Therefore, there was some amount of error in his calculation of his Ascendant. 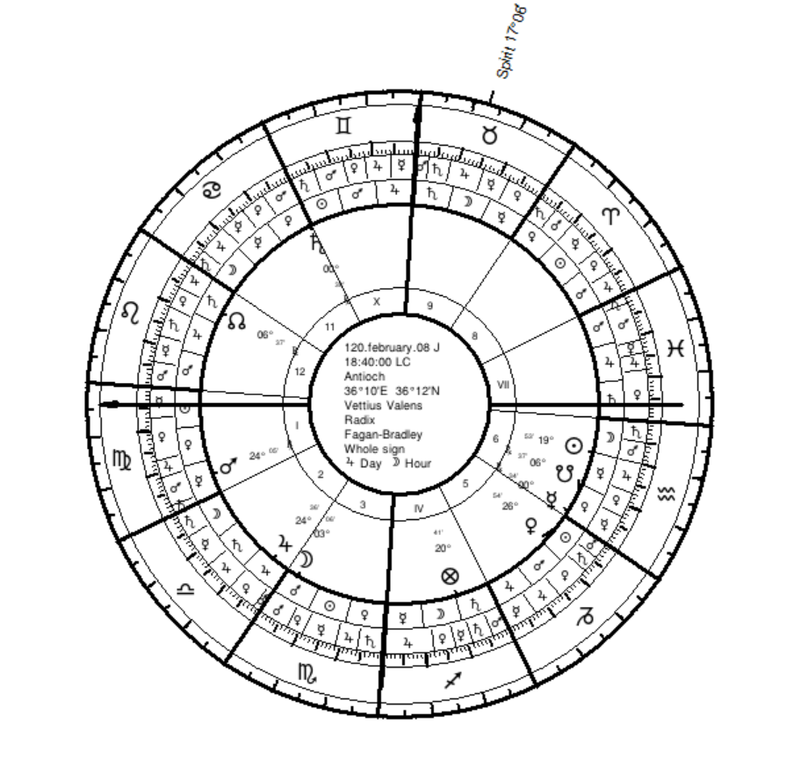 The Raman ayanamsha chart below has 6° Virgo rising. Somewhat shockingly, Valens was using sidereal tables that were about 4 degrees off from tropical positions. Significantly, they were also almost 3 degrees off from typical sidereal positions used today, including Fagan-Bradley and Lahiri. This was at a time when the tropical and sidereal zodiacs are said to have nearly coincided. If the Fagan-Bradley ayanamsha accurately reflects the original sidereal calculations of the Babylonians (as is claimed), then the sidereal tables of Valens’s time had accumulated significant error. Valens was born with 4 retrograde planets! Jupiter stationed retrograde within 24 hours of his birth, while Mercury would station direct within 2 days after his birth and is in phasis. The Fagan-Bradley chart below is not an accurate reflection of the sidereal tables used by Valens as indicated by the 3 degree error in Sun position from that given by Valens. However, it is included as it better accords with typical sidereal standards today. Most western siderealists use the Fagan-Bradley ayanamsha while most Indian siderealists use one close to it within about a degree. I include the tropical chart below too, just for those interested in analyzing it. However, Mercury and Saturn end up in different signs in it than those given by Valens. Note that my software gave us the wrong planetary day and hour for Valens. The calculation is a day off in terms of planetary days. Valens was born on a Mercury day (Wednesday) and Sun hour, but from our current ordering of days he was born on a Jupiter day (Thursday) and Moon hour. As noted, the Romans officially adopted the seven day week and the naming scheme of planetary days with Constantine in the early 4th century CE, long after the time of Valens. 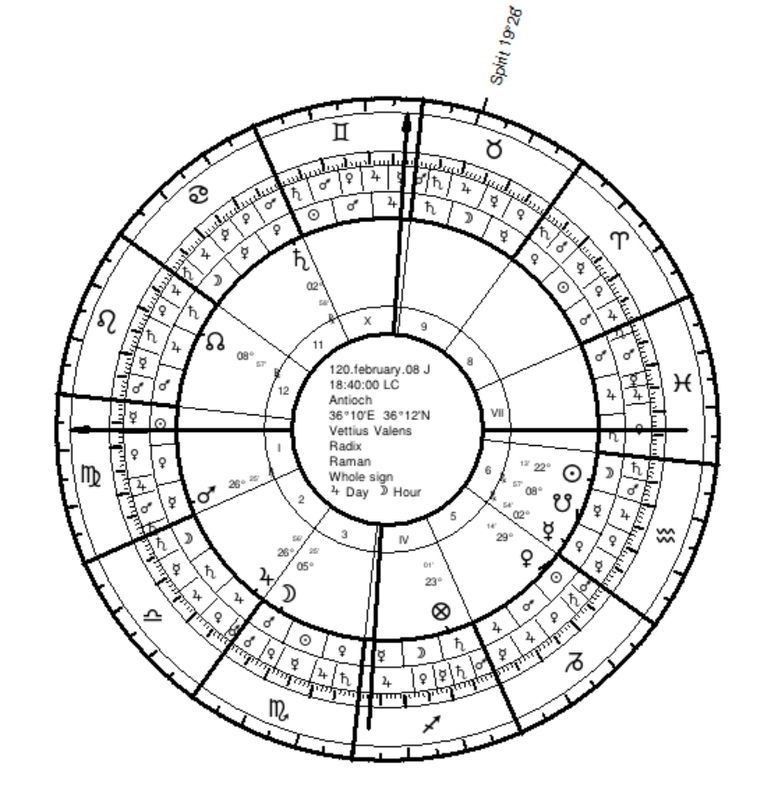 I am told by reader Ricardo Carmona that the Hellenistic astrology program, Delphic Oracle, calculates the correct (Mercury day) for Valens. There can be multiple “years” and “months” considered. For instance, Valens noted he is taking the ruler from the start of the first day of the month of Thoth in the Alexandrian calendar (Julian Aug. 29th). He said he does this because it how the old astrologers found the ruler of the year. This is interesting as it suggests that some of his sources used planetary hours, days, months, and years. However, Valens also instructed that he thinks it would be more natural to use the heliacal rising of Sirius (original start of the Egyptian year) as the first of the year. Similarly, we might consider January 1st the first day of our civic year and/or the spring equinox as the first day of our astrological year. Finding the planetary day is trivial. It is your day of the week converted to its ruling planet. Sunday, Monday, and Saturday are easy as ruled by the Sun, Moon, and Saturn respectively. Tuesday goes to Mars, Wednesday to Mercury, Thursday to Jupiter, and Friday to Venus. It is not very difficult to figure out planetary hours either. If you know your local sunrise and sunset times, then you can figure out the length of the day and of the night. Dividing each by 12 will give you the length of each hour. The hours start with the ruler of the day at sunrise. But be aware that a new day doesn’t start until sunrise, so 4 am on a Tuesday morning is actually a Monday night in the context of this system. For those who want a quicker and easier reference, there a number of websites with applets. Here is a link to an easy one. I have at times found the planetary days and hours to be useful. They are relatively popular in the western magickal tradition. In that traditional they are mainly used for electing times to perform rituals. I’ve found that they can occasionally be helpful in natal astrology as well. Their early treatment by Valens should inspire more experimentation by traditional astrologers. I have not experimented at all with the planetary years and months noted by Valens. This year is a year of Mars. Time will tell if the scheme for universal years according to the local civic calendar will prove useful. Featured image is in the public domain. 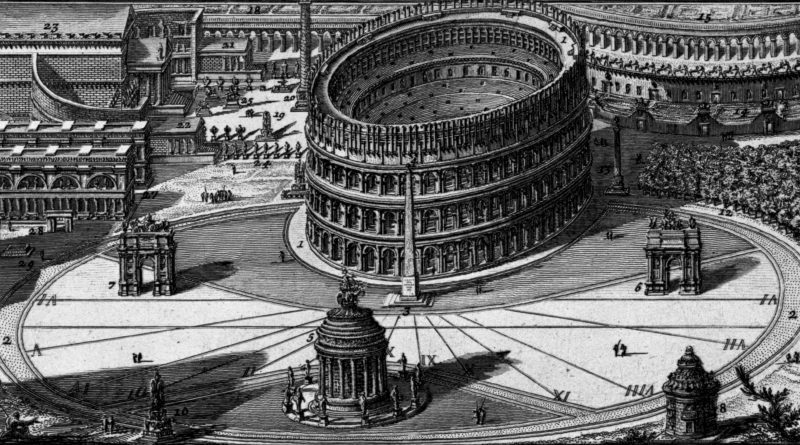 It is a portion of “Elevazione dell’Anfiteatro di Statilio Tauro, e degli altri edifizi che gli eran vicini” (1762) by Giovanni Battista Piranesi. It depicts the Solarium Augusti. Thanks to reader Ricardo Carmona the coordinates for Antioch have been corrected on the charts of Vettius Valens. Coordinates in original article were for the city Antioch in the US which was erroneous (and embarrassing). Thankfully, there was not a very significant impact on the estimated sidereal due to similarity in latitude. The biggest change is that the Moon is a little earlier in Scorpio than in the previous estimate due to change in longitude. I’ve also added the sidereal chart in the Raman ayanamsha which evidently reflects the sidereal tables available to Valens which much greater accuracy. This gives us a better glimpse into how the chart positions would have looked to Valens. ← Why Use the Tropical Zodiac?